Thammasat University’s Pattaya campus has opened three new Faculty of Engineering buildings, funded by Siam Motors Group and Bangkok Bank, in response to the rapidly growing automotive industry and the upcoming ASEAN Economic Community. Thammasat was aware of the necessity to produce qualified automotive engineers to supply the demand in industry for the start of the AEC. Hence the school began a bachelor’s course in automotive engineering, taught in English, at the Pattaya campus. 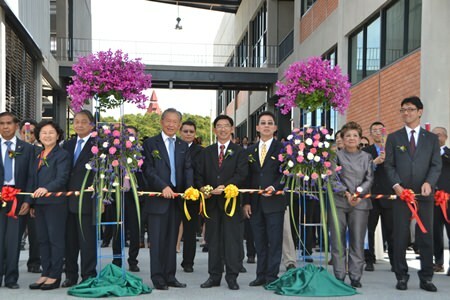 Executives, including Phornthep Phornpraphan – President and CEO of Siam Motors Group; Somkit Lertpaitoon – Rector of Thammasat University; and Kazutaka Numbu -President of Nissan Motors (Thailand) Co., Ltd. cut the ribbon to officially open the new engineering buildings. The university also has signed an agreement to support education management in automotive engineering with Siam Motors Group, and Bangkok Bank. Siam Motors contributed 60 million baht and Bangkok Bank gave 30 million baht for the Automotive Engineering Operations Building, the Siam Motors Group Workshop Building, and the Bangkok Bank Dormitory. The Sept. 9 opening ceremony also featured an exhibition of faculty inventions, including a compressed-air car, which produces no pollution and is powered by a 4-horsepower air engine with 200 liters per minute of air flowing through it. The car is only able to drive about 600 meters but is a proof-of-concept prototype. Thammasat’s Pattaya campus is well-supported by the Eastern Seaboard auto industry, with Toyota Motors (Thailand) Co., Bosch Automotive Thailand Co., Komatsu Ltd., Daikin Industry (Thailand) Ltd., and Isuzu (Thailand) Co.
Additionally, Nissan Thailand has supported Thai education by contributing a Nissan operations room with modern engineering testing equipment.